Dr. Martin Luther King Drive extends from 9th Street Downtown, west and north all the way to the St. Louis border with the small town of Wellston, Missouri (population ~2,300). The western terminus of MLK in St. Louis is a block west of Hodiamont Avenue. Skinker is the western border of St. Louis until it splits as Kienlen Avenue just north of Page Avenue when Kienlin Street and Cockrill Street define the St. Louis border with Wellston. 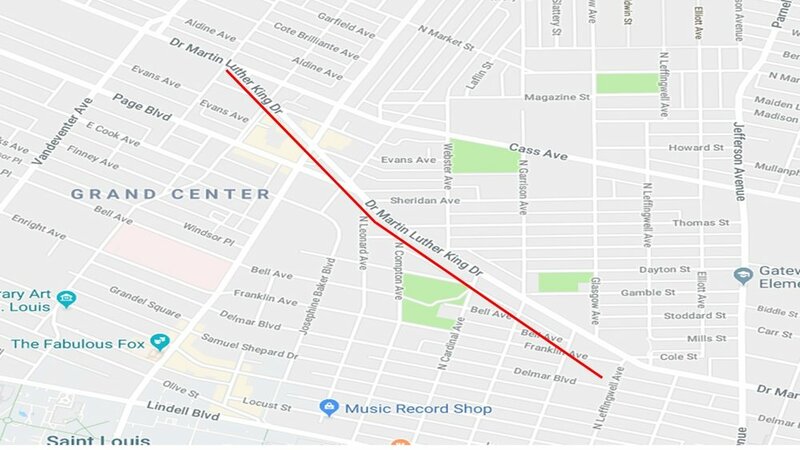 MLK runs parallel with Delmar Boulevard, just a block north of the much-discussed dividing line between North and South St. Louis before it splits from Delmar in a northwestern direction just west of Jefferson Avenue at Leffingwell Avenue. Along with Delmar and MLK, Natural Bridge Road shares a near parallel pattern through North City and the 3 are key commercial corridors. MLK provides a border for 17 neighborhoods. If the residents, neighborhood, business community and city chose to invest in MLK (which my photos will show, have not) you would see a positive effect on a lot of neighborhoods. It would be money well spent. I'm flummoxed by the lack of interest and dedication to making this a functional business district for the residents of North City that remain, but are dwindling fast. The bones of an amazing commercial corridor are there, but they are in rapid decay. Maybe that has something to do with the ~20 year trend of Black Flight, population exodus out of these areas. White Flight occurred through the 1980s until the white population was completely gone. Now it's Black Flight we see. These are historic times for North City as the citizenry continues to vote with their feet leaving North City neighborhoods. Census data shows that from 2000 - 2010 these 17 all-black neighborhoods have lost a combined 10,574 residents. Staggering losses. If you include the racially diverse neighborhoods of Grand Center, Midtown, Downtown and Downtown West, you have a gain of 5,535 residents in the same timeframe. That means a total of 5,039 lost in the neighborhoods along MLK in just ten years. The data is clear and indisputable, we are living through the Black Flight period of North St. Louis history. The commercial strip along MLK toward Wellston, shows this vacuum effect. My photos will bear witness. Also, when snapping alley and closeup photos, squatters have moved in to many of the properties that were more secured in previous visits. It's not a good scene and has worsened greatly in the last 8 years or so. Much of the building stock is wide open to the elements and people looking for somewhere to get shelter and in many cases, get high are moving in. Sad state of affairs. So what is there to see on MLK these days? This street is a fascinating study in current St. Louis events. Based on what I've read, up to the 1980's it was still fairly functional in providing services and goods for the residency. And of course it was bustling in the 1950's and 60's. "In the 1950s and '60s, the street was once home to big stores like J.C. Penney, Jupiters Clothing and Woolworths. Restaurants lined the street from east to west, and on a typical day, more than 30,000 people arrived through the Wellston Loop streetcar system." "Charlie Johnson has lived in his Greer Avenue home for more than four decades. He and his late wife, Ozell, moved into their Greer Avenue home in 1973, when the neighborhood was filled with working people and members of the black middle class. Even baseball players Curt Flood and Bob Gibson would rent homes there, Johnson recalled." "For the last few decades, Johnson has seen the homes on his block move from occupied to vacant. He’s also watched as the problems of Dr. Martin Luther King Drive — abandoned buildings, drug dealing and violence — spread to surrounding areas." This large swath of St. Louis was still mixed race up until the 1970's when White Flight was in full swing. "It was important to have a street named for an activist, absolutely," Todd said (Jesse Todd, long-time civil rights activist and then treasurer of the Democratic Central Committee). But he acknowledged by 1972 the Franklin and Easton were already showing signs of falling on hard times. They became in short order one of the hundreds of streets named for King surrounded by decay and crime and disinvestment." It got worse the farther you traveled west from Downtown. 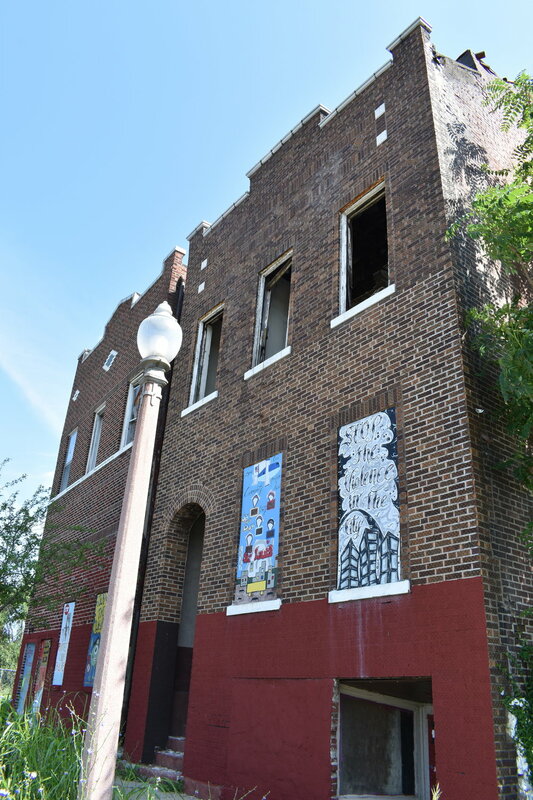 "But after MLK Drive passes west through Grand Boulevard, one can see an increasingly powerful state of disuse, wearing away the streetscape, spreading its destructive poison on once proud storefronts where small businesses once thrived, and mocking the empty warehouses and industrial buildings, so many of them not only vacant but also crumbling." "Valiant, underfunded efforts reveal the futility of efforts to keep ahead of urban blight and decay, so even an ally such as optimism runs down the fronts and sides of buildings and puddles in pools of neglect and decay on the broad avenue called — originally in earnest tribute — Dr. Martin Luther King Drive." "In a survey of the nation's most crime-ridden neighborhoods by Dr. Andrew Schiller of the website NeighborhoodScout.com, St. Louis' very own downtown, specifically the intersection of 14th Street and Martin Luther King Drive, ranked fourteenth." "As residents fled to North County retailers followed them. New shopping areas like Northland (1955), River Roads (1962), Northwest Plaza (1965), and Jamestown Mall (1973) opened to serve the new suburban middle class. Franklin & Easton Avenues would have declined even it not renamed. Can this corridor be revived? To the point of being the honor it was intended? I have my doubts. Perhaps we should do something different to causally honor Dr. King’s legacy and return the street name to Easton & Franklin Avenues?" Another UrbanReviewSTL post from January, 2006 documented MLK from the time. "I can’t think of a more significant street in the African-American community in 1972 than Easton Avenue. Natural Bridge never had the nice pedestrian scale of Easton Avenue and Delmar was significantly residential. Even today you can tell that Easton Avenue was the street in North St. Louis." "Experiencing the street today and seeing how vibrant it once was has proven depressing to me. The surrounding area, while it does have some positive signs, is largely stuck in deep poverty. So many forces have led to where we are today: government lending policies that encouraged suburban growth while discouraging renovation of existing properties, white flight followed by middle class black flight, closure of the streetcar line and failed policies of “urban renewal” projects." So there you have a fairly thorough document of MLK leading up to current times. Now l'll simply share some photos to capture where we're at today. I'll keep the commentary to a minimum and let the pictures do the talking. To make this photo cache easier to follow and break the story up a bit, I'll take this in three separate legs. As you can see, lots of incongruity, vacant lots and suburban schlock. There is a real opportunity for a decent stretch from about Jefferson west to Leffingwell where a row of original buildings are still in pretty good shape (former Sam Light pawn shop, etc). There was a recent renovation of the site of where electrical workers united to form unions (IBEW), it is now called the Henry Miller Museum. It's great to see a could decent looking blocks, mainly by the split with MLK and Page Avenue in the Covenant Blue/Grand Center by Firehouse #17. There is even some investment in sidewalks and crossings here. A rarity in North City where ward money is typically not spent on sidewalks and pedestrian infrastructure. Lot's of suburban schlock in this stretch as well. And finally, leg 3 to the St. Louis border with Wellston. This is the stretch with tremendous potential to become THE commercial strip to serve North City. The vacancy and trespassing/squatting witnessed on this scooter ride was staggering. This is the worst I've seen the area in my years photographing the city. Sadly, there appears to be no plan or prioritization to save MLK's former commercial strip. I hate to say it, but I predict more losses of the most important element of any city...residents...people. The 2020 Census will tell the story of flight or leveling off. I can only hope this is rock bottom for MLK Drive and we'll see the residents, neighborhoods and building owners invest in their community.